In 1999, in the small provincial town of Beauval, France, 12-year-old Antoine Courtin accidently kills a young boy in the woods near his home. Panicked, he conceals the body and to his relief and ongoing shame, he is never suspected of any connection to the child’s disappearance. But the boy’s death continues to haunt him, shaping his life in unseen ways. More than a decade later, Antoine is living in Paris, now a young doctor with a fiancée and a promising future. On a rare trip home to the town he hates and fears, Antoine thoughtlessly sleeps with a beautiful young woman from his past. She shows up pregnant at his doorstep in Paris a few months later, insisting that they marry, but Antoine refuses. Meanwhile, the newly discovered body of Antoine’s childhood victim means that the case has been reopened, and all of his old fears rush back. Then the young woman’s father threatens Antoine with a paternity test—which would almost certainly match the DNA found on the dead child’s body. Will Antoine finally be forced to confront his crime? And what is he prepared to do to keep his secrets buried in the past? 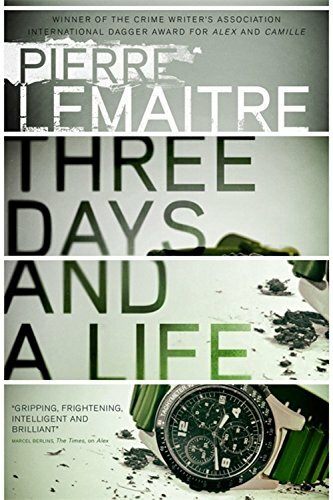 Pierre Lemaitre’s new novel Three Days and a Life is a captivating and disturbing Hitchcockian thriller with plenty of twists and turns. The prolific French novelist and screenwriter is internationally known for crime novels and has won numerous literary awards that include the prestigious Prix Goncourt and Crime Writers’ Association International Dagger awards. Yet despite Antoine’s clear guilt, Lemaitre is expertly able to generate just enough compassion for him to draw the reader into an uncertain place where even though they might wish to see justice served they don’t want him to feel any more pain. Overall, Lemaitre magnificently manipulates the readers’ compassions and succeeds in dropping several remarkable plot twists that surprisingly help alter the initial events. Three Days and a Life is a heartbreaking and darkly disturbing psychological page-turner written with simplicity and creativity. A thoroughly captivating suspense-filled read that will not disappoint any devoted thriller enthusiast.